Explore New Zealand with a flexible 'Book As You' hop on/hop off bus, scenic coach, ferry travel and sightseeing pass that allows you to travel on New Zealand's largest bus and scenic coach passenger travel network, including Cook Strait ferry sailings between the North and South Islands all year around, traveling in any direction on the combined national travel networks of InterCity Coachlines and Great Sights - with its premier scenic coach and sightseeing services everyday! Your Flexipass allows you travel on regional and long distance bus, coach and scenic coach services through out New Zealand, plus your pass can be used for an Inter-island ferry services between the North and South Islands, dolphin watching cruises in the Bay of Islands and lots more. With Flexipass, travel on modern, air-conditioned, eco-friendly buses and coaches featuring reclining seats with foot and head rests, with some long distance scenic coach and sightseeing services having onboard washroom/toilet facilities. Flexipass is based on every 'Travel' hour used, so every 'Travel' hour is discounted, so you will be saving money, as you travel plus it gives you total freedom to alter your plans whenever you want. You can travel and get on and off as you please or create your own itinerary and travel when you want too. Your Pass is valid for 12 months so you can stay a while and leave when you please. Your Flexipass covers selected sightseeing tour options and all bus, coach and ferry travel. Optional sightseeing or attractions extras - like entrance fees, meals, scenic flights, etc are additional and are charged to your prepaid, debit or credit card. With Flexipass you can top up with additional 'Travel' hours to suit your travel needs. You can use your Flexipass on Wellington to Picton ferry services that operate between the North and South Islands. To plan your Flexipass travel requirements, click to download your Flexipass travel planner and choose a travel option/s from a range of suggested travel plans or just travel when you want too. You can check online - availability, rates and make instant confirmation accommodation reservations to suit your Flexipass travel. Flexipass is great for individuals, families and small groups who are planning to travel together on the same routes and destinations. Flexipass can not be used for travel on the TranzAlpine train between Christchurch, Arthurs Pass and Greymouth. Using a pre-planned scenic travel journey, travel on the combined national networks of InterCity Coachlines and Great Sights with its premium scenic coach and sightseeing services everyday! Your Travelpass is a 'Book As You Go' pass for bus and coach travel through out New Zealand plus it can be used for an Interislander Ferry sailing between the North and South Islands, dolphin watching cruises in the Bay of Islands and lots more. With Travelpass, travel on modern, air-conditioned, eco-friendly buses and coaches featuring reclining seats with foot and head rests with some long distance and sightseeing coaches having onboard washroom/toilet facilities. Travelpass is available from 2 Day to 14 'Travel' days, using a range of pre-planned travel itineraries, whether travel is in one Island or both the North and South Islands. Set your own itinerary and travel when you want. Your Travelpass is valid for 12 months so you can stay a while and leave when you please. Wellington to Picton ferry services are included in all Travelpass Passes if you are travelling between the North and South Islands. You can check online - availability, rates and make instant confirmation accommodation reservations to suit your Travelpass travel. Travelpass is great for individuals, families and small groups who are planning to travel together on the same routes and destinations. For a range of TravelPass pass options. 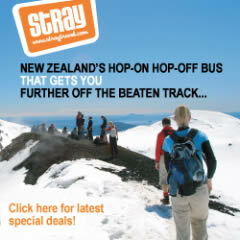 Stray is New Zealand's flexible bus network for the adventurous traveller allowing you to 'jump-on' and 'jump-off' our buses anywhere you want, along the way around our comprehensive New Zealand national route network. Go further off the beaten track for unique and down-to-earth stops, local culture and amazing activities. Travel with our our legendary driver guides, in small modern buses, making it easier to meet people and do more. We have an extensive range of New Zealand bus passes for all time frames, that are valid up to twelve months and allowing you to travel as many times as you like, with ‘unlimited travel’. To book accommodation for your Stray travel - click on the accommodation links left of this page for online availability, rates and reservations. Wellington to Picton ferry services are not included in Stray Travel passes.